If you would like to delete WhatsApp messages that already sent, you have a time limit for that. WhatsApp doesn’t allow you to remove messages for everyone about 1 hour later that you sent the message. So if 1 hour didn’t pass yet, you can delete those WhatsApp messages. It hasn’t been over an hour. Ensure that it hasn’t been over an hour that you have sent the message. Tap and hold onto message. Select the message you want to delete. Tap and hold onto it. Tap trash can icon. A menu will appear at the top of the application. Find the trash can icon on the menu. Tap Delete for Everyone. You will see a popup menu with selections now. Just select to delete it for everyone. You deleted this message. Ensure that your message replaced with “You deleted this message” text on WhatsApp. Go to chat. Select the chat that you want to delete WhatsApp messages that already sent. Tap and hold on messages. Tap on hold on a message that you want to remove. Navigate WhatsApp menu. Tap on black arrow on WhatsApp menu which appeared at the top of message that you want to delete. Tap Delete. When you see the delete option, select it from menu. Select Delete for Everyone. In the menu, select delete for everyone. When you delete messages as we have told above, your friends are going to see a text: “This message was deleted“. They are going to know that, you have deleted a message which you have sent them. You have 1 hour time limit to delete messages for everyone. 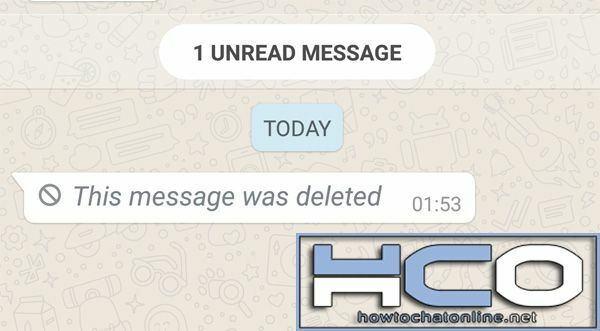 This is all we can tell you about deleting WhatsApp messages that already sent… You can find more information and tutorials about WhatsApp at incoming days.